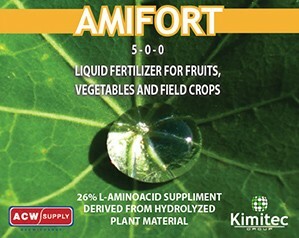 Kimitec Amifort is a liquid fertilizer composed of 26% L-Amino Acids proceeding from double enzymatic hydrolysis. Kimitec Amifort is a liquid fertilizer composed of 26% L-Amino Acids proceeding from double enzymatic hydrolysis. Amifort is completely water soluble and suitable for use in hydroponics and works very well as a foliar application. Derived through double enzymatic hydrolysis of plant proteins. Kimitec Amifort increases the effect of pesticides by chelating the pesticides with Amino Acids, so it is recommended to reduce pesticide dose, especially with products containing sulfur. Available in 1 Liter, 5 Liter, and 20 Liter.